Simply, a zap cap is a cylindrical bottle opener gadget, you flick it over a crown cap (like on a beer bottle or some soft drinks), the crown cap jumps off and is caught by a magnet. People use them several times a week. 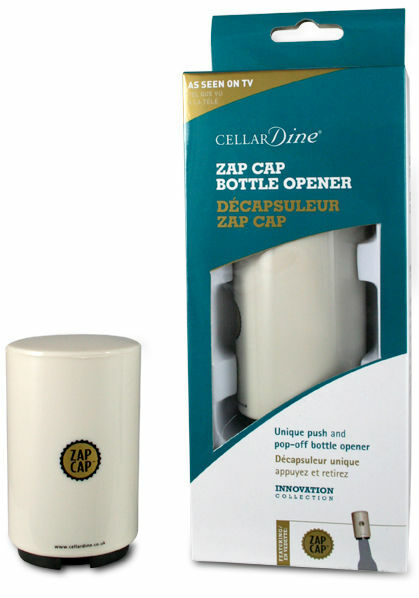 We get emails saying things like " Zap Cap is the coolest thing in my house " and telling us that visitors admired the bottle opener and when the visitors left, it could not be found. So these magnetic bottle openers are exciting, actually are used and give pleasure throughout the year. They also make gift giving easy even if it is a gift to your self. Zap Cap text, images and video are copyright.